Husband and older two kids were out of town for the weekend so Resa, JF, and I attended Mass with my parents. We went to the Cathedral for the closing Mass for the Sheen novena. If it please God and Sheen is declared a saint December 9th will likely be his feast day (I have this on no authority but my own) because it was the day he entered into eternal life. Thanks to Julie from the Sheen Foundation for taking our picture. I lifted this picture from the Sheen blog. Clearly I had recently been nursing Resa, which is why my shirt is bunched up and not looking too hot. Oh well. Grey tank: Target maternity - I wear it almost every day and wash it only weekly. Is that gross? The girls all wore pink for the third Sunday of Advent. Resa was napping during this picture, though. Boys' clothes: All hand-me-downs or gifts. L's dress: WalMart, from Easter. She's worn it almost every Sunday since. It's my turn with the flu. Thanks, Tracy! A good nap and I'm already feeling better. I hope I'm 100% for tomorrow - Christmas with my parents and siblings and I don't have anything wrapped! Ah, the flu. Such a downer. It took me a long time to wear color, too. Not until I was married - but I love it now and I wonder why I didn't do it before. 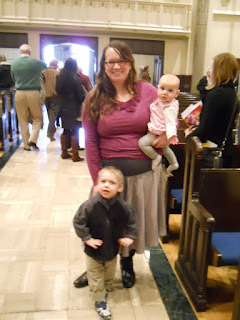 Love the liturgical clothing colors ;)... don't love the flu. Re: washing the tank- not gross at all! Resourceful :). Thanks! :) Resourceful... I like it. Haha...hair in the face. I know that one. My little one is only 18 months but I comb her hair everyday and yet everyday she pulls those pony tails right out and then she looks worse then without her hair combed. You can't win with those kids! I love the pink for advent. I know what you mean about the hair looking worse - Lydia will have a huge ridiculous wave in the back and bangs hanging in her face in the front. Phew, glad to know I'm not the only one washing daily worn tanks weekly. ;) Love the liturgical colors! Hope you all feel better soon! Ha! You and me, Lisa! I hope you have a quick Christmas recovery and great Christmas! -darn iPad cuts off my comments midstream! I'm sorry you have the flue, Bonnie. Hope it skedaddles before Tuesday fer serious! Love that you were color coordinated every weekend. You so do have your act together. Hot pink is definitely your color, walmart or not. Thanks, Jenny. I'm shocked at how good it looks actually! Hope you are already feeling great! Oh. My. Gosh. ALL of my Target cardis lose buttons. I got some great deals on them last year, and they all ended up being garbage. When the buttons came off, holes were left! Anyway, I love your Gaudete outfit. The silhouette is lovely. I'm glad I'm not the only one disappointing Target sweaters. You are awesome. Hope you are feeling better! Love that your children's fashions are represented here too. And your boots are great. Most families I know have something (ear infections/stomach bugs/flu) threatening their Christmas plans. I hope everyone gets healthy at your home by the 25th. Yes, there seems to be a lot of sickness going around. Our flu seemed to be 24 hours per person so - thankfully! - I'm better already. You are totally on the ball with your liturgical matchiness :) I love both the oufits and hope your family is back to healthy soon! Ha! Yes, that's James, playing with his sister. help you out in catching a glimpse of their favorite racers. of around a million people, represents less than 0. Thirdly, you can simply book your car in Corralejo per only 134 a week.